We have a great big alternator. 210 amps at 12 volts – over 2500 W. Huge. It’s driven by two large V-Belts off the main crankshaft. In the olden days, you would buy a matched set of V-Belts to use in a dual application because it’s important that they are the same size. Exactly. Modern manufacturing methods mean that the premium belts are uniform enough that you don’t need to buy them in pairs. We’ve had a problem where the tach would jump around when the alternator was producing maximum power. I always figured it was electrical noise and would go wiggle the connectors. Eventually the tach would settle down. I never suspected belt tension, since I regularly check and re-tighten the belts. However, the belts aged differently. The inner belt stretched slightly, and under heavy load would slip slightly, heat up, and transfer all the horsepower into the outer belt. Eventually that belt would also heat up and slip – just enough to show up in the tach needle (diesel engines get their tach signal from the alternator, since there is no distributor producing an electrical pulse). You can see the belts are now differently-colored from the aging. So, two new belts from spares and everything was right in the world. Solar versus Alternator, Tach Loses. This is a nerdy one. We have a huge 210 Amp Balmar alternator on the engine. It’s controlled by a separate Balmar MC-614 Charge Controller. We also have a huge 400 Amp solar array mounted on the pushpit. It’s controlled by a Morningstar TriStar MPPT charge controller. The purpose of the two charge controllers is to give our huge(ish) battery bank what it wants. What our battery bank wants is maximum amps until it’s at 14.4 volts, then 14.4 volts for a couple of hours until it’s mostly charged, then 13.2 volts for a long time to “top off” the charge. Even though they don’t really communicate with each other, usually the solar charge controller and the alternator charge controller work well together, mostly because the batteries aren’t that picky. However, we’ve had a few times where we’ll be motoring along on a sunny day and the tachometer signal will disappear, often while we’re anchoring or entering a harbor or are otherwise distracted. Here is what the deal is: The batteries are full but the charge controllers are somehow off synchronization. The alternator controller is trying to hold a trickle charge of 13.2V, but the solar power controller has decided that the batteries really need 14.4V and pump in the juice. The alternator controller sees the higher voltage, thinks that the world is coming to an end, and faults out. It would be fine if all it did was shut down the alternator until we re-started the engine, but the alternator controller also puts out a synthetic tachometer signal that the engine control panel uses to tell the meat how fast the engine is running. So, now, if the tach shuts down while we’re running, we close up or cover the solar panels. Problem solved. 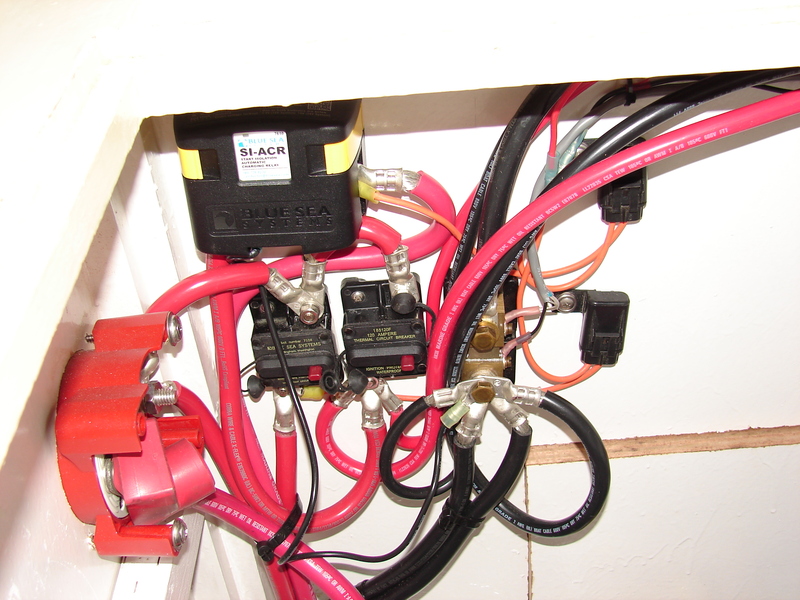 The big electrical loads on the boat are the refer, the watermaker, and the autopilot. We spent a lot of time putting together the most energy efficient systems we could find. The lighting loads are minimized by our fantastic new LunaSea LED lights. They put out more light for way less power than the old incandescent or Cold Cathode fluorescents. The LED anchor and navigation lights are especially important in limiting our energy use because they’re on for long periods. We have two major ways to make the electricity. 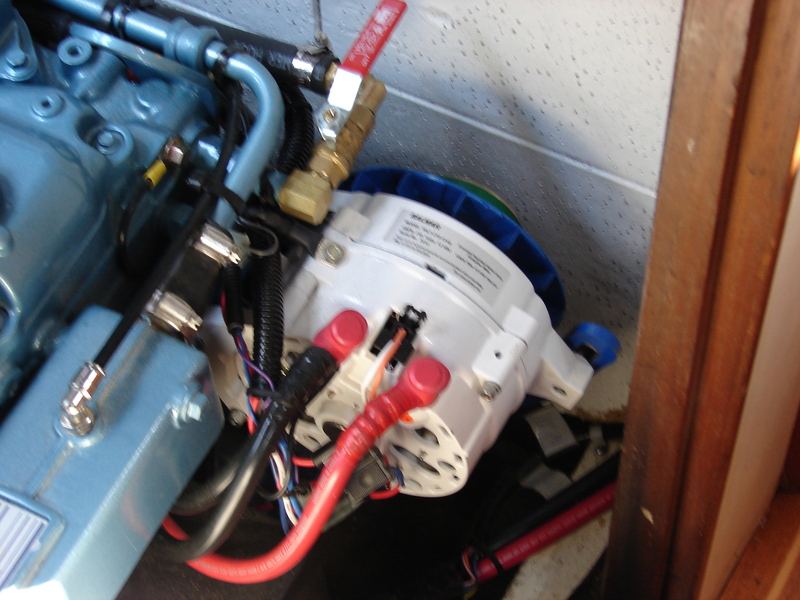 The primary source is this large-frame alternator on the front of the motor. It’s as big as your head. The external regulator keeps the charging current high for much longer than an automotive alternator, and temperature regulation keeps the alternator and the batteries from overheating. Nancy absorbs solar energy and re-radiates happiness rays. The solar panels absorb solar energy and turn it into electrical energy. Each pair of panels is wired in series, then the panel sets are wired in parallel into the MPPT tracking controller at the top of the picture. The controller makes sure the batteries get the voltage and current they need to maximize their performance. 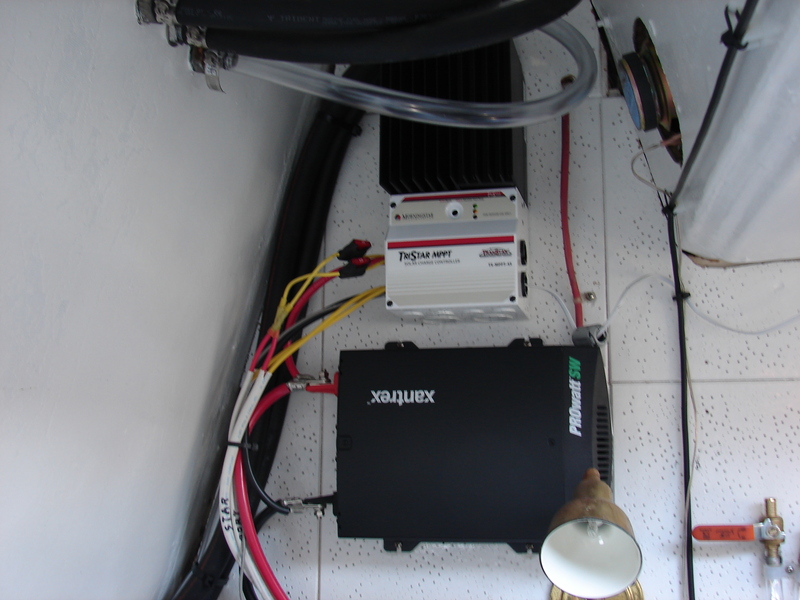 The black Xantrex box under the controller is a 600W True Sine Wave inverter. It’s big enough to run our sewing machines, battery chargers, and other small loads. It’s not big enough to run a vacuum cleaner. Xantrex products are crap, but there are few options in this size. The electricity is stored in the house battery bank for use later. These are super 8D AGM batteries, 270 AH each for 540 AH total. Not huge, but good. Moving the power around takes some pretty big copper. The red blob on the left is the primary battery disconnect. The black rectangle above is a relay to parallel the house and engine starting battery during charging. The two smaller rectangles below are the breakers for the main power distribution and the anchor windlass. 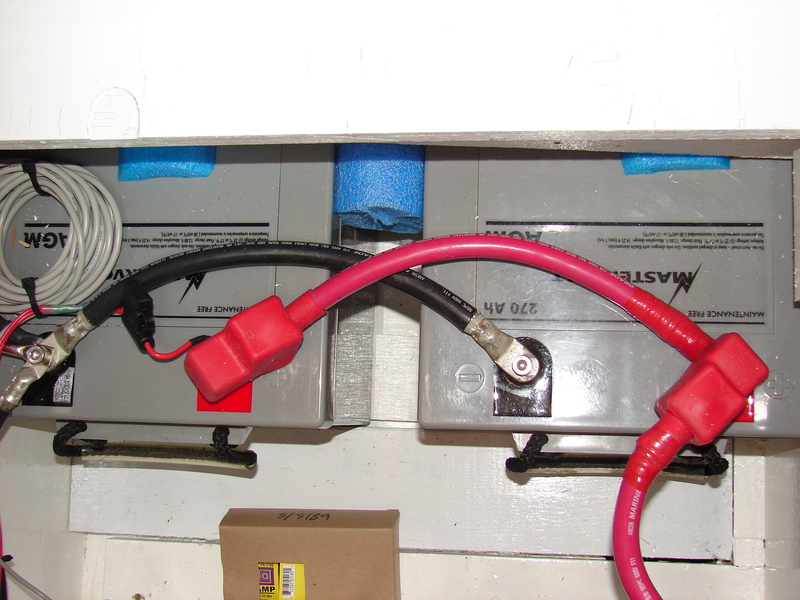 The jumble on the right is a calibrated shunt that we use, with a Mastervolt computerized monitor, to measure and track the amount of power left in the battery. 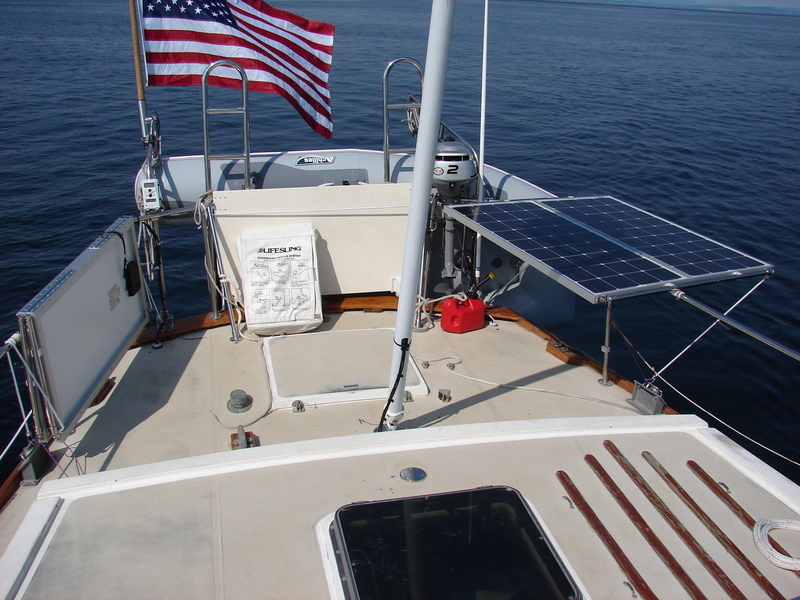 The solar panels can be quickly stowed in place or deployed flat using a telescoping stainless tubing fitting mounted on the front and aft ends of the panels. We’ll leave them up most of the time. So far we’ve seen 240W from the 400W panels. We’ll see more as we head south. 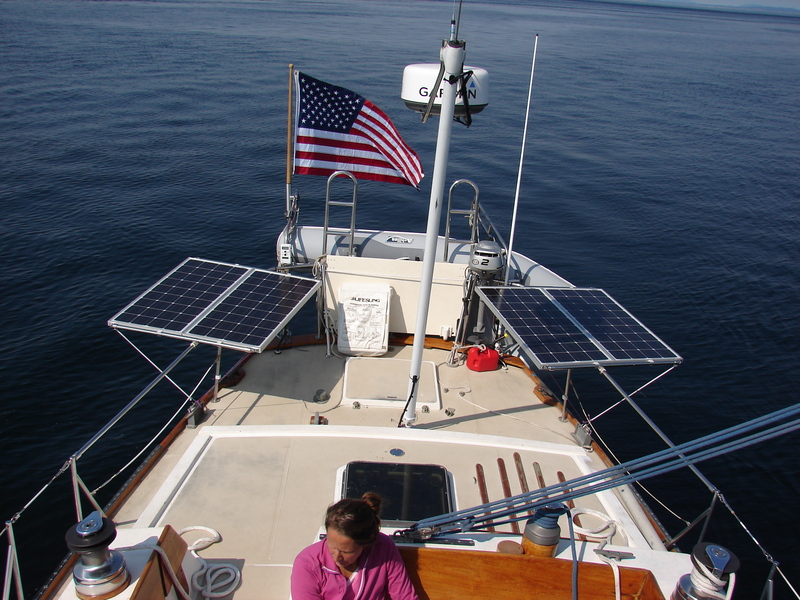 The panels don’t gimbal because we will always be at anchor, so the boat will move; and we’ll be south, so the sun will be overhead, mostly, on average.